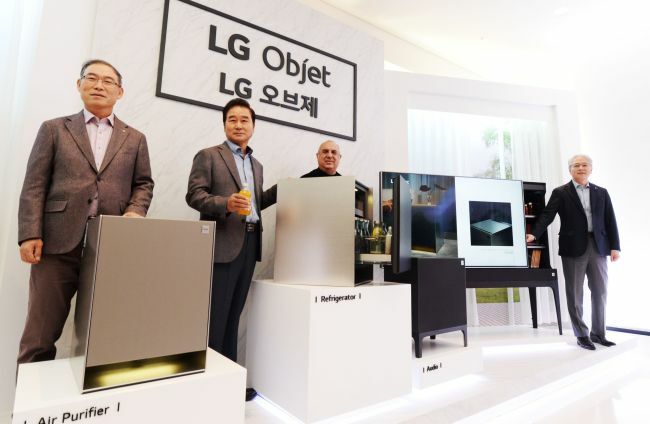 LG Electronics has created another category for home appliances combined with furniture by launching a new brand Objet on Thursday, which the company defined as being premium and private. The LG Objet brand lineup consists of four items -- refrigerator, air purifier, audio and TV -- designed for consumers who want to put them in their private spaces like their bedrooms. To introduce the brand as one for converging electronics with furniture, the company adopted wood and steel as the main materials, to bring an analogue feel of the furniture. The ash wood, in particular, comes in nine different colors, and is certified by the US National Hardwood Lumber Association in terms of quality. The Objet fridge, resembling a hotel mini bar, runs on thermoelectric elements instead of a compressor – the core component for most fridges – which makes it free of vibration and noise problems when placed next to the bed or sofa. Song added the Objet product line could further be expanded beyond the current four, hinting that the company could design appliances for bathrooms, too. Targeting the Korean market in the initial stage, LG plans to export the Objet brand worldwide, especially European markets where design elements are highly appreciated among consumers. The Objet products will be produced based on customer orders and will take three weeks for production.